Must Love Robots is drawing to a close and they are having an finale event that anyone can take part in – provided there is a local Subway restaurant near them. Fifty years ago, 36 titans of industry, fearful of a possible robot uprising, started building substations into Subway restaurants where they could input a special code that would trigger the robo-apocalypse no matter where they were in the country. The code is input via the soda fountains at Subway. No, I’m not making this up. The codes are numerical, so you will have to number the different soda dispensers left to right as 1 through 8. There are two different codes that can be input into the soda fountains. One code will destroy the robots. The other code will save the robots. You will have to provide evidence that you input the code, either via photographs or videos. The missions need to be completed by July 13th, so Sunday, July 12th will be the last day to actually do the mission. When you have your photographic evidence, you will need to submit it to either Pastor Ned (PastorLudd@godhatesrobots.org) if you have destroyed the robots, or Johnny Lugnut (Johnny@vivalarobot.com) if you have saved them. You can keep track of how many people have chosen at Johnny’s new website VivaLaRobot.com. This will be your last chance to take part in a Must Love Robots event unless you’re coming to Portland, so don’t miss out. Just because this isn’t a structured event doesn’t mean that you can’t have a blast completing it. Update: The robots have been saved (for the time being)! Thanks to everyone who submitted videos – even if it was for the 36. So now that the robots live on, we can still find 011ie true love. So it’s not quite over yet! If you have been playing Must Love Robots and attended the special press conference held by Carol Coldoil about the new Terms of Service at RobotFriendFinder.com, you were treated to a special announcement of one of the events at the upcoming ARGFest 2009: Robot Speed Dating! That’s right, folks! Must Love Robots is going to be having a live event at ARGFest 2009 where you can try to win the heart of a special robot someone. It had already been announced that the creators of Must Love Robots would be in attendance, but the live event was a carefully kept secret. Of course, that didn’t keep some of the ARGFest Planning Committee members from taunting some of us about a super secret announcement. There will be a sign-up soon where you can register for the Robot Speed Date. In the meantime, may I suggest you go and register for ARGFest 2009 or at the very least check out the T-Shirt Contest. I’m quite partial to the Must Love ARGFest shirt – and not just because I designed it. It’s because you really Must Love ARGFest and Robot and Fanboy are totally awesome. I hope to see everyone, robots and humans alike, there. 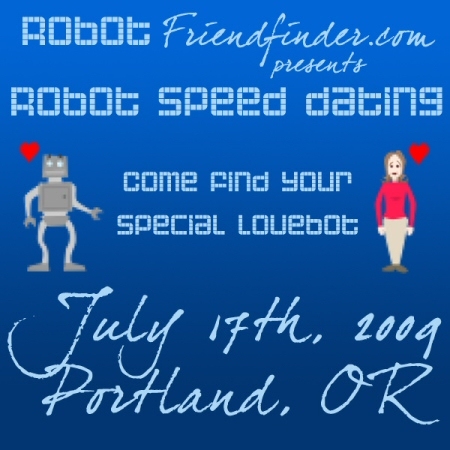 Update: The Robot Speed Dating sign up is now available at RobotFriendFinder.com. You will have to first register at RFF and then request to be added to the Robot Dating Group in order to participate in the Robot Speed Dating event. And you know you want to. You don’t want to be the only one at ARGFest on Friday who doesn’t have a robot date. You’ll feel so left out. I was originally going to post about this on Friday before I left work, but didn’t get around to it. However, if I had posted, it would have been with the caveat that this wasn’t an actual scripted event, but something I was hoping could happen based upon the premise of the game. Must Love Robots is all about finding robot love for 011iver, a very sweet robot who lives with his wacky friend Tim Scribbles. Tim has been trying to find a girl to go out with 011iver and I thought it would be great if someone from the NYC area could charm 011iver into asking them out on a date. Wasn’t sure if it would ever happen, but if a bunch of people could run around Central Park with fennels yelling “BONUS! BONUB!” surely someone could try to seduce a real fake robot for a date. Of course, I had no idea that the first someone to do that would be me. 011iver contacted me over the weekend asking if I could meet him for a picnic date (which Tim would film for Must Love Robots). I’ve agreed and am just waiting for actual details to be sorted out. But this means that the possibility for others to go out on a date with 011iver just went up. So what are you waiting for girls? Sign up at RobotFriendFinder.com and start chatting up 011iver. You can also find him on Twitter as @011iver. He’s really sweet and who knows? Maybe the two of you can find true robot love. Update: I almost forgot – if you’d like to get a free Inactiveware t-shirt, be one of the first two “robots” to send in a video response to one of the Must Love Robots videos. Update #2: 011iver has posted a video on RobotFriendFinder looking for tips for this weekends date. So please head over there and sign up and let him know what your advice is. Or, if for some reason you don’t want to sign up to RFF, his friend Chuck has also posted the video on her blog where you can comment. Our date is scheduled for Saturday, May 23, 2009 at 2pm EDT at the Arch at Grand Army Plaza, which is the northernmost point of Prospect Park in Brooklyn, NY. I’ll be arriving at Port Authority sometime between 7am and 11am (depends which bus I take) and departing NYC between 8:30pm and 11pm. If you would like to meet up with me outside of my date with 011iver, let me know. I’m already possibly meeting with one or two other people from #unfiction, but the more the merrier! Update #3: My picnic date with 011iver was great! Except for when the ‘roboist’ showed up and threatened violence which caused 011iver and Tim to panic and leave. My (in-character) write up is on my blog. The Guide write up and videos from Tim should be coming soon.